We've all seen the heartbreaking images from Haiti as that nation struggles to recover from the devastating earthquake which struck last Tuesday. Around the world, relief efforts are underway to give much needed assistance to the Haitian people. The United Nations World Food Programme has launched a six month emergency operation in Haiti to help feed millions of Haitians affected by this tragedy. As some of you may remember, food and wine bloggers worldwide recently united to support the WFP through blogger Chez Pim's annual Menu For Hope fundraising campaign. The most recent campaign raised nearly $79,000 for the WFP. Several food and wine bloggers are once again answering the call to assist those in need, and you can help as well. Marc Matsumoto (blogger at No Recipes) has organized a special fundraising campaign through his Blog Away Hunger effort. The following bloggers have pledged to donate their January ad revenue to assist the Haiti relief efforts of the WFP and other charitable organizations. You can help by simply checking out their blogs if you haven't done so already. 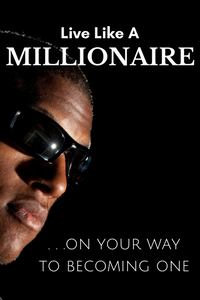 Ad revenue is generated through page views, so I encourage you to peruse some of the older posts on these blogs. This is a good opportunity to check out some great recipes (not to mention some gorgeous food photography) while helping a worthy cause. gas•tron•o•my -I've followed Cathy (a.k.a the gastronomer, an L.A.-based food blogger) for a while. It is through her site that I found out about this particular fundraising effort. 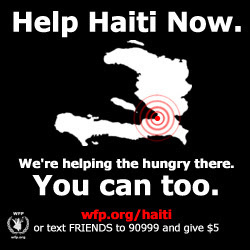 If I may direct you to my sidebar---->, I've added a badge (just like the one pictured above this post) which will link you to the WFP's donation site where you can give directly to their efforts in Haiti (if you choose). I've also added a link to Marc's Blog Away Hunger page. Every little bit helps and no gift is too small. Even if you are unable to donate, just spread the word! Thanks! ETA: I just found out about another great fundraiser coming up through Rob over at North Georgia's Montaluce Winery blog. It's STIR IT 28: Food Bloggers Align For Haiti Relief, and it's being organized by local food blogger Bren Herrera (FlaNboyant Eats) along with Chicago-based food blogger Courtney Nzeribe (Coco Cooks) and L.A.-based food blogger Chrystal Baker (The Duo Dishes). For more info and details on this fundraiser, click here or email bren@flanboyanteats.com. I will do a more detailed write-up on this event in a post coming soon. Stay tuned!